Mary and Takeshi are talking. On sunday morning, at Mary's host family's. Takeshi: Mary, what do you usually do on the weekend? Mary: Let's see. I usually study at home. But I sometimes see movies. Takeshi: I see... then, would you like to see a movie on Saturday? Takeshi: Then, how about Sunday? Host mother: Good morning. You are early, aren't you? 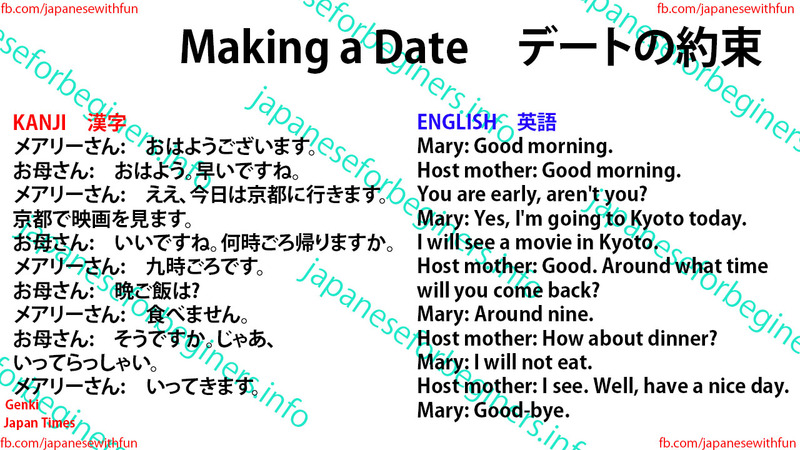 Mary: Yes, I'm going to Kyoto today. I will see a movie in Kyoto. Host mother: Good. Around what time will you come back? Host mother: How about dinner? Mary: I will not eat. Host mother: I see. Well, have a nice day.